This October I had the opportunity to work with young shredder, Riley James. Sydney and I traveled up to a lake near the Iowa/Missouri boarder this summer to give lessons to the James family for the day, and this is where I first met Riley. In that single session, Riley landed a tantrum in only five attempts. It was at that point I knew he had serious potential. I was extremely excited when I found out that Riley was coming to train with us in Florida for a few days. 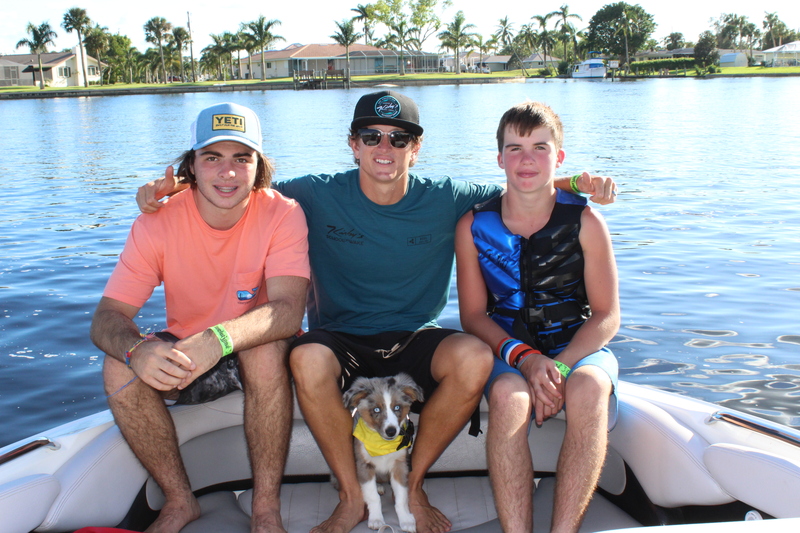 It has been a dream for Sydney and I to open our home to allow students like this to come stay and wakeboard. By the grace of God, our new wakeboard school location in Fort Myers, Florida is allowing this to become a reality. Our home is perfectly positioned to have quick access to glassy boat-riding conditions on the Caloosahatchee River and are minutes from Revolution Cable Park. Not only that, but our guest room is equipped with Wi-Fi, Apple TV, and an Xbox; stocked with action sports movies and the classic, Wakeboard Unleashed game. I personally love this set up and knew we could provide a wakeboarder’s paradise for other riders as well. Riley was joined by his cousin, Carter, who brought a whole nether level of stoke to the trip. It was cool for me to see both teens feeding off of each other’s excitement and progression. Riley arrived early allowing us to get a jump-start with lessons at Revolution Cable Park. He had only ridden a cable park two other times prior, so we took our time getting him aquatinted with hitting all of the obstacles. It wasn’t long and he was locking into full pulls and spinning off of some of the hardest rails at the park. It’s a lot of fun to see a student really connect right away like that. Part of learning though, is overcoming obstacles, and at the cable park, Riley literally had an obstacle to overcome. At the park, there is a wide box A-Frame with two ramps on each side for doing transfers. The ramps on the side makes for more creative options, but can cause a nasty fall if you slide off the top section early and make impact with the ramp. After a slip up on this obstacle, Riley became a little shook up and was reluctant to hit it again. In athletics, it’s important to not build walls and create boundaries around past negative experiences. This kind of mentality can really limit ones potential. After explaining this to Riley, and a few laps of riding doubles with him showing him exactly how to line it up, he overcame his fear, and was hitting that obstacle with ease for the rest of his trip. The next day, we headed out to the Caloosahatchee River for boat lessons. It had been a while since I was able to work with Riley, so we got right to work on fine-tuning his basics on heelside and toeside jumps. This process may not seem like much to students in the moment, but it leads to rapid progression in the next stages of learning new tricks. Riley finished up his first set by taking his toeside 180 wake-to-wake. Back at the cable park, we worked on toeside 180’s off of the kicker. This quickly led to Riley unlocking his first toeside 540 off of a ramp on his first try. The video clip is sick. I have it posted below for you to check out. Moments like that one that really stirs up the fire within me for coaching. He didn’t know what all the small steps that I was having him do were leading up to, but it completely paid off in the end. This same type of scenario continued to play out for the remainder of his trip. In the next few days his progress skyrocketed as he learned a toeside backroll off the kicker as his first cable park invert. Then he did switch backroll, halfcab roll, front roll, and a scarecrow all in only a few sessions. We took the momentum that he had built up from landing the scarecrow at the cable park and went to work on trying some on the boat. Anytime I have people learn a front roll based trick on the boat, I make sure that they can edge hard enough toeside to clear the wake on a 70ft rope. This is an eye opening experience for most riders when they realize how big of a gap that is to clear with a toeside approach. Riley mastered this challenge right away, so we quickly moved on to trying the front roll. On his first attempt I noticed how he immediately rotated a scarecrow. I jumped right on this and sent him into landing his first scarecrow in only two tries. This was a huge victory! On his next visit I plan to go back and have him continue working on the front roll though, as it’s a very crucial trick leading up to learning crow mobes. Hands down, Riley has been one of the most fun students that I have had the pleasure of coaching. He puts in an amazing effort every time he hits the water with a great attitude. The thing I like most about Riley is how genuinely grateful he was the entire time he was staying with us. There were multiple times when he would thank Sydney and I for letting him stay with us or just for helping him accomplish a trick. He is a great young man and I am pumped that I had to opportunity to work with him. Way to go Riley! Can’t wait to have you back to Fort Myers to visit us again!